Seldom are there enough clues to give a complete description of the geologic history of an area , and oftentimes geologists must extrapolate from elsewhere. This is certainly true in the Taos area, as only a small fraction of the 4.6 billion years of Earth history are preserved in the rock record. During the last two billion years, the continental crust under New Mexico has drifted across the globe, resulting in a continual evolution of climates--from the extremes of glaciers to hot deserts--that are reflected in the rock record. Even though Precambrian rocks represent more than 80% of the rock history of Earth, and constitute 17% of Earth's land surface, our knowledge of Precambrian geology is wistfully incomplete. In the Taos area, Precambrian rocks compose most of the highest mountain peaks, and include a wide variety of rock types and ages. The oldest rocks in the area are in the high Taos Range, and appear to be igneous rocks that formed between 1.8 billion years ago. These are also the oldest rocks exposed in the state. Approximately 1.7 billion years ago, a thick pile of sedimentary rock accumulated in a large ocean basin. These rocks were deeply buried and metamorphosed. About 1.4 billion years ago, large granitic intrusions were emplaced in these older metamorphic rocks. Nearly all of the Precambrian rocks exposed in the Taos region have been dramatically affected by this complex and dynamic history. These ancient rocks are easily seen in many places, such as in the towering cliffs near Pilar, at the Taos ski valley, at Ponce de Leon hot spring, at Red River Pass, and on top of Wheeler Peak. These rocks contain much mineral wealth, such as the gold at Twining, the copper at Copper Hill near Penasco, the "fairy cross" staurolites in the Picuris Mountains, and the clay used for pottery by the Picuris Pueblo. Unfortunately, we have no rock record preserved here for the next billion years, until the sedimentary rocks of Paleozoic time. During much of late Paleozoic time, a large basin, called the Taos trough, existed as a sight for the accumulation of great thicknesses of mud, sand, and silt. Over time, as the sediments were compacted, they became the sedimentary rocks limestone, sandstone, shale, and siltstone. These Paleozoic rocks are exposed over most of the southern part of the Sangre de Cristo Mountains. Excellent exposures can be found on NM-64 along the Rio Fernando, and south of Talpa on NM-518. A close examination of these rocks commonly reveals evidence of their original environments of deposition (rivers, deltas, shorelines, tidal flats, shallow seas), including features such as ripple marks, raindrop imprints, and cross beds. The Paleozoic seas teamed with ancient life, and the fossilized remains of hundreds of marine species of bivalves, snails, sea lilies, corals, etc. are also readily visible. These fossils indicate that the rocks were deposited in a shallow sea that covered the area about 250 million years ago. Although sedimentary rocks such as these were deposited at the sea bottom as horizontal layers, here we see the beds dipping at an angle. At several different times since the Pennsylvanian, great mountain building events acting over millions of years have folded and faulted the beds into their present positions. New Mexico's state fossil is Coelophysis, a 6-ft-long Triassic dinosaur found at Ghost Ranch. Photo by Mark Nohl, courtesy of New Mexico Magazine. The Triassic and Jurassic periods were characterized by deposition of non-marine sandstones and shales over much of northern New Mexico. Until Late Cretaceous time, this area was alternately land and sea, as the shoreline advanced and retreated. Sand and gravel were deposited along streams on the flat coastal plain, and coal beds were formed in the numerous swamps. 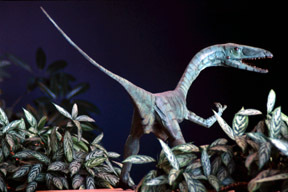 Dinosaurs roamed the plains, consuming lush plants, small mammals and amphibians, and one another. Shale, sandstone, and limestones were deposited on the sea bottom. Although no rocks of these ages are visible from Taos, they are near Angel Fire to the east. From late Cretaceous time to early Tertiary time this area was compressed by forces associated with the Laramide Orogeny. Compression of Earth's crust resulted in major uplift and erosion, and development of folds and faults. The western half of the Taos trough was eroded away, and by Tertiary time only rolling hills remained. 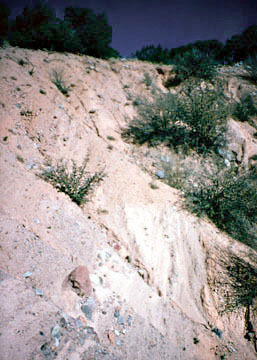 The Tesuque Formation of the Santa Fe Group, the principal rift-filling unit of the Rio Grande Rift fill in northern New Mexico, consists mostly of layered sands, silts, and gravels. In Miocene time, another major orogenic event began which has dramatically affected the present shape of the land. With extension of Earth's crust, the Rio Grande Rift area began to subside, mountians rose along rift-flanks, and volcanoes began to erupt. The mountain uplift and filling of the rift with late Tertiary sediments continued slowly until, by Pleistocene time, the modern Sangre de Cristo Mountains had formed. During the ice age, glaciers covered the higher peaks and scoured out depressions called cirques. The plains area was still settling slowly, and the streams from the mountains carried gravel into this topographic low. From time to time, while the rift was filling with gravel, volcanoes to the west erupted, blanketing the gravels with lava, damming streams and creating temporary lakes. During the last several million years, the Rio Grande has cut through those gravels and lava to form the modern Rio Grande gorge. 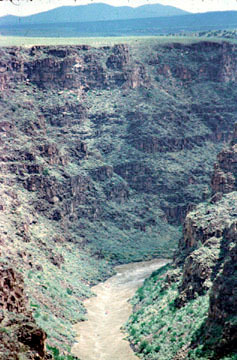 Over 800 feet of basalts and sediments are exposed in the Rio Grande gorge. View north from the Gorge Bridge on US 64. Today, as rifting continues, streams continue the ceaseless process of moving weathered rock from the mountains to the basin. The uplifting takes place episodically by a series of small movements, each one resulting in an earthquake. These processes work so slowly that we see little or no change during our lifetimes. If the mountains had been uplifted only one inch per century, they would have risen almost 5 miles during the past 30 million years. The rift-filling sediments, known as the Santa Fe Group, represent a combination of material eroded from the flanking uplifts and material transported into the basin, mainly by rivers and streams. The rift basin structure is complex, generally consisting of a deep, inner basin flanked by relatively shallow benches that step up to the margins. The benches are separated from the inner rift by faults.